As the bouncing sound of bluegrass escaped the Home Team restaurant in Charleston, it was joined by the incredible smell of BBQ Fish Tacos. 3 Mix together the red cabbage and vinegar and set aside for 30 mins. 4 Make the guacamole by mashing up all the ingredients with a fork in a bowl and set aside. 5 Make up the pico de gallo by mixing the ingredients in a bowl and set aside. 6 Grill the fish on the BBQ for 5 minutes on each side until cooked through, being careful as you turn the fish that it doesn’t break apart. 7 Once cooked set aside in a warm place for 5 minutes to rest. 8 Flake the fish into a bowl discarding the bones and skin. 9 Grill the tortillas over the high heat for 5 seconds per side and rest on a plate covered with a cloth to soften. 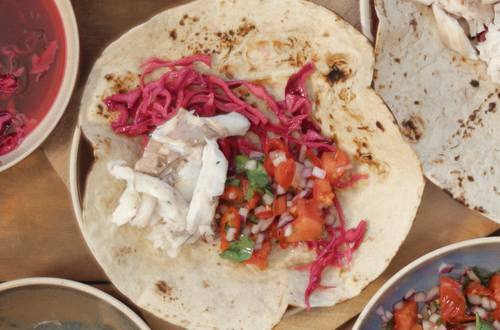 10 After 5 minutes assemble the Tacos by placing some flaked fish onto a wrap with a spoonful of guacamole, pico de gallo and cabbage. Serve warm.